The Whelming › Shoot me! In my continuing “toolspam” series, I would like to introduce a tool for all Wikimedians traveling with a camera (and maybe a smartphone), and the will to use it. I call it Wiki ShootMe!. Wiki ShootMe! comes to the rescue! Upon loading, the page will try to find your location (your browser should ask you to allow that); if your computer has access to GPS, it will use these coordinates, otherwise, it will guesstimate your location from your IP address. Whether you allow this or not, you can add/alter coordinates manually, or use an existing Wikipedia article with coordinates as position. Enter a radius (5-10km in a city is usually plenty), and maybe change the language of the Wikipedia you want to add images to, and run (the tool, that is). ShootMe! will now find all articles with coordinates within the radius around the given position, and check them for pictures. 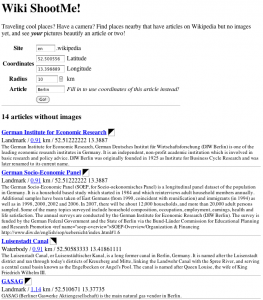 Those that lack images will be listed with a link to the article, a quadrant symbol (e.g. ◥ means north-east), a type (e.g. 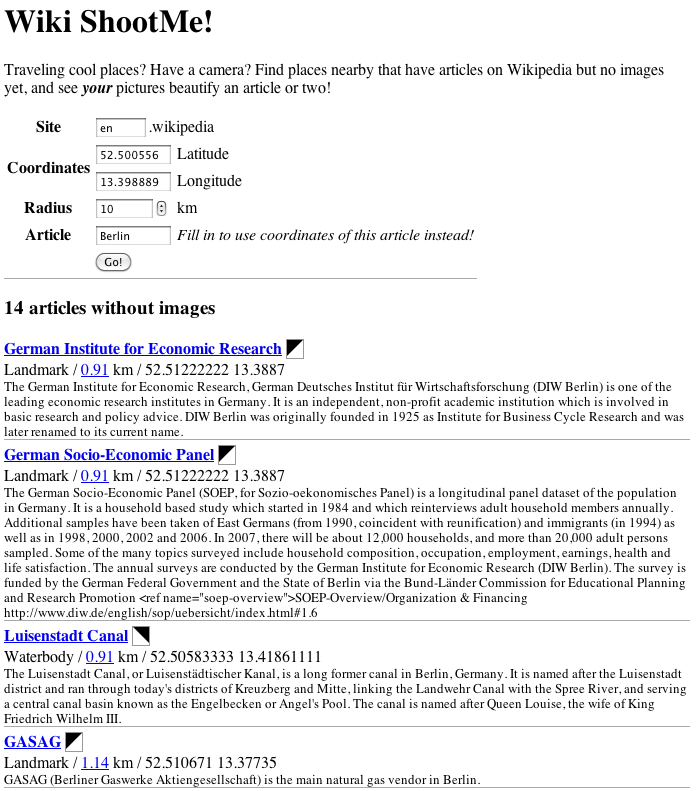 “landmark”), the distance to the given position (with a link to “Google maps walking directions”), the article coordinates, and the article intro section (some articles have coordinates referring to the “former site” of the lemma). At the end of the article list, there is also a link to a map with image-less articles. Now this can be handy for preparations, but, as the sparse page layout suggests, the real fun starts when using this on a “smart” mobile device, such as a mobile phone or tablet. Just open the tool page, click (sorry, touch) one button, and a few seconds later, you can see nearby sites worth visiting with a camera (or maybe even without). You can plan a route to go down the list, or just reload the tool at the next location – your own paperless paper chase through the neighbourhood! Picture (literally) your next vacation trip: no pre-defined tourist route, obscure sites (the obvious “boring” ones probably have images), and you can share your snapshots on Wikipedia! But who says you need to wait for vacation? Try your current location, at work or at home – you might be surprised at the nearby sites you never knew about, have a nice walk, and help Wikipedia. Profit!